.................add a dog into the mix and see what happens! The wedding was a week ago Saturday and I am still kind of catching my breath! I know some of you are waiting to see pictures. Both my DIL Michelle and niece Randi were taking pictures and shared albums on Facebook. My friends and family who use that platform have seen some of these already. My girlfriend Helen was taking informal photos as well but those are coming via US mail in a few days! My niece is a talented videographer and there is a video you may wish to see on You Tube HERE. It was a lovely gift for Charles and I but also a way to share our wedding weekend with family and friends who were with us in spirit. 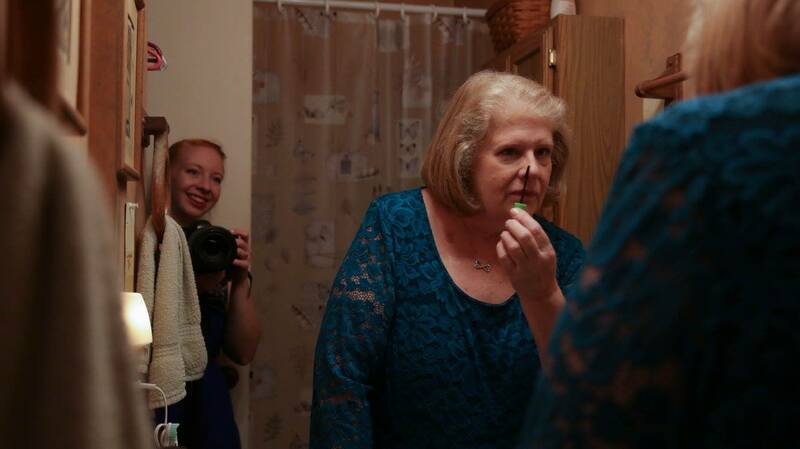 My sister Diane was my matron of honor and honestly I don't know how I could have pulled this all off without her! 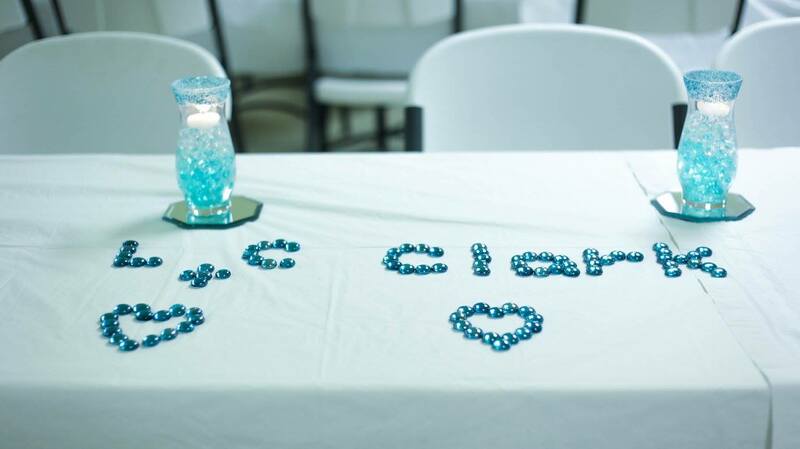 She not only got my parent's flight arranged along with her own but she took over the fellowship hall decor. ( Diane is the brunette at the center of the picture above.) My sister Janet and daughter Randi also flew into ATL from Colorado on very little sleep and met up with the other three at the airport. Janet rented a car for them arriving at my house about 2 pm or so. 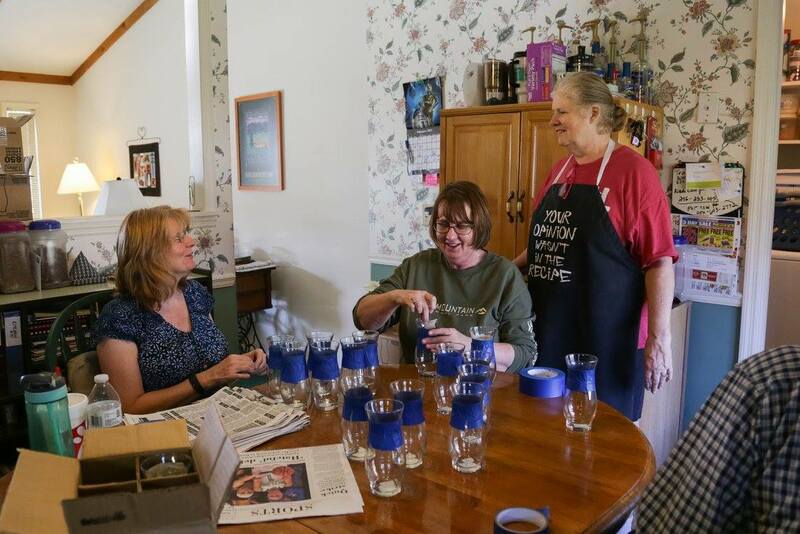 Mom was absolutely beat and laid down to rest but the girls and my dad gathered around the table to start taping 3 dozen little hurricane vases to "bling them up" for the tables! Diane and I had consulted back and forth on the 'net and phone for about two weeks about size, colors, shapes, which combo of glitter and stones would achieve the desired effect. Then she had the boxes shipped from the vendors or packed them up and sent here. I admit I was NOT much help and messed up the one jar I sprayed, LOL so I continued with prepping the ingredients to make Shrimp and Tofu Pad Thai for our supper! Charles had a doctor's appointment in Birmingham so was not on hand to greet the family but joined in the glitter party on the driveway on his return. We had soaked two 5 gallon buckets of aqua and clear water beads Wednesday night. The picture shows the vases being filled. (The video, a little sequence of it as well.) 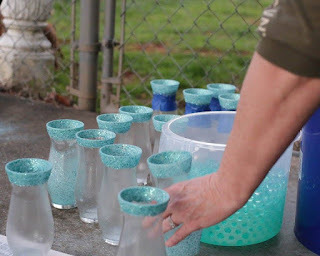 Diane did a suspension of teal stones and silver pearls for the three head table vases. I'll have to take a better picture of it for you as it is still holding up! Friday arrived and a busy day was ahead of us. Charles drove in from his place with Abby in tow so she was keeping everyone entertained back at the house. 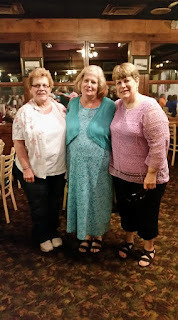 We women took off for Ladies Lunch at Classic on Noble joining my quilting buddies. My sisters made me put on a bride to be sash and the Belles a tiara---you'll see that in the video! After lunch, I needed to run back home to get the frozen lemonade ice cubes and punch ingredients. Charles was waiting at the house and said "there are two gals down at the church who said they knew you in school". He was right! I had expected them for lunch as well when I found out they would be arriving on Thursday. My phone was messing up big time in the fellowship hall. Charles and Dad went out to lunch with Abby while we were dining. The guys got the stuff loaded up from "Wedding Central" and unloaded at the church where everyone pitched in to get the Fellowship Hall set up. Well, me not so much---Mom and I were mixing punch base, LOL. It looked lovely! We finished up about 3 and Abby conked out in the car on the way home but did not stay down then. The trip to the church two hours later for rehearsal did the trick. Charles laid her down on the back pew and she did not stir but she also did not get to practice like the rest of us either. Somewhere on someone's phone there is video of him walking her down the aisle practicing throwing her petals. 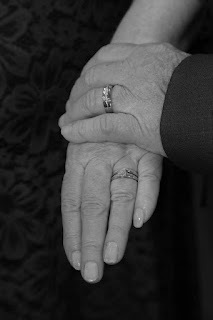 I saw it after the fact as we were trying not to see each other before the ceremony! Rehearsal dinner was held at the nearby Top of the River. Helen and Polly my two high school pals were able to join us--finally! Also my brother Dave and godchild/niece Allison's flight got into ATL in the early afternoon so they joined us as well. I had to go get the wedding flowers first thing. The poor florist had said she would get started on them after Valentine's Day and then come to find out, had gotten a bad case of the flu making the rounds. I had called and left a message and no return call. I followed up mid week with another call and found out it was her first day back in a week. 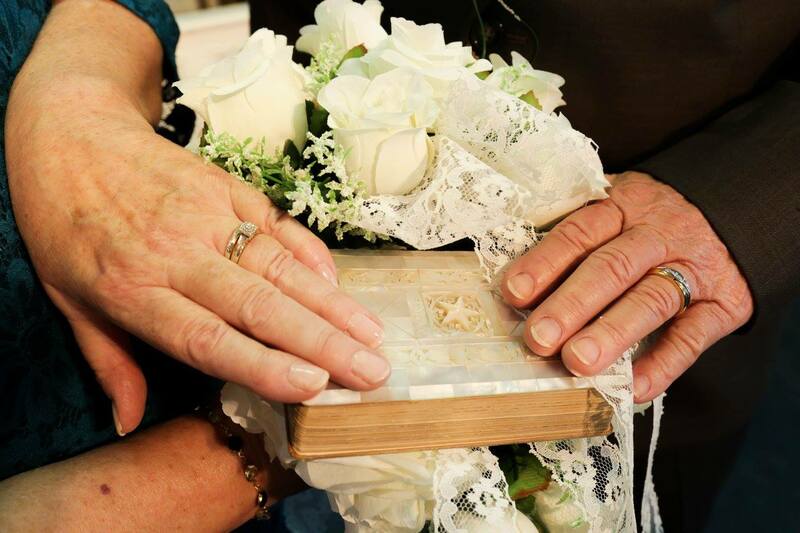 I wanted the Mother of Pearl Bible my mom had brought back from Israel for us girls to use in our weddings incorporated into my bouquet. 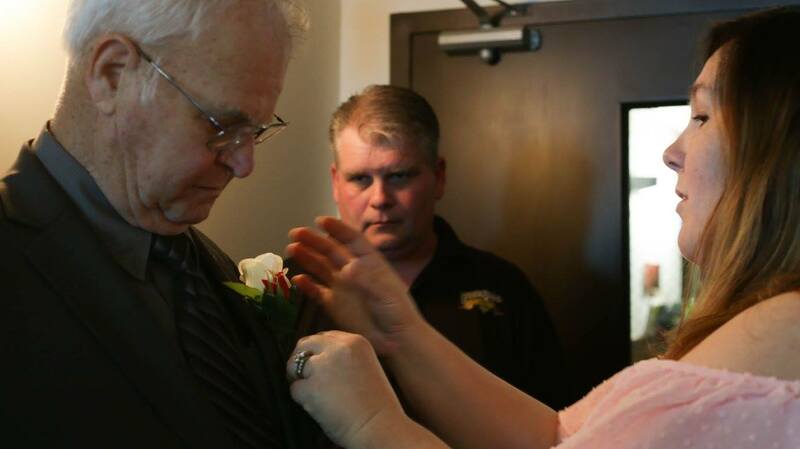 The wedding instructions/date information and some ribbon I had picked out were with it and then it was misplaced. The date was with the Bible and not in her reminder book as it turned out. She recalled the conversation the more I mentioned about it saying it was a good thing I had called when I did!! The materials were on the shelf and she promised they would be done by Friday p.m. or I said Saturday a.m. would be okay before 11. 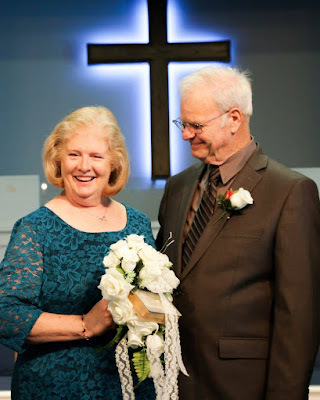 She did a lovely job and it looked like the Bible was cascading with the roses. Diane helped with hair and makeup and we arrived at the church in our attire. Charles waited to change at the church. People were running interference to keep us from spotting each other. Dad at one point was standing in the doorway looking "O.G" cracked me up! I was hiding in a back Sunday School classroom off the sanctuary but also greeting a few of the guests as they came in and spotted me. 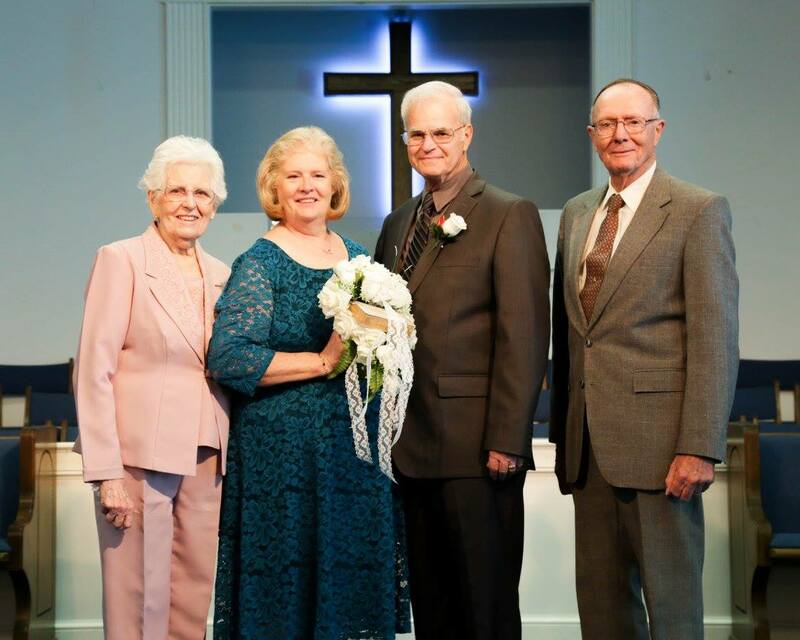 My brother Steve and wife Jan arrived on Saturday from Tennessee as did friend Cindy and her husband John. Charles' cousins Jim and Linda were the first to arrive with their spouses. I had met Jim and Rosemary in person recently but not Linda and Frank except online. Araya, Emma and Abby were running around before the guests and maybe even afterwards from what my pals are telling me. Charles and Michelle walked Abby through her flower girl duties a couple times, as I said. I was told she was throwing them all willy nilly with Mama but almost perfectly placed and in a row with Gramps. If she dropped two, she picked one up, LOL! You will see a picture below. 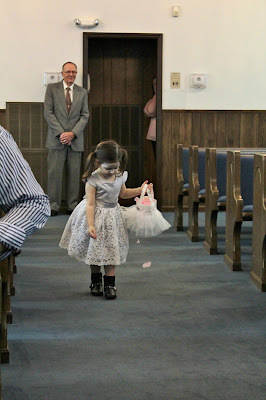 Her aisle walk in the video is adorable! Here my DIL Melissa and SIL Brian are helping with the corsage. Charlie told me 4 people tried to get it pinned on him! He said one of my sisters finally got it in place. All dressed up! 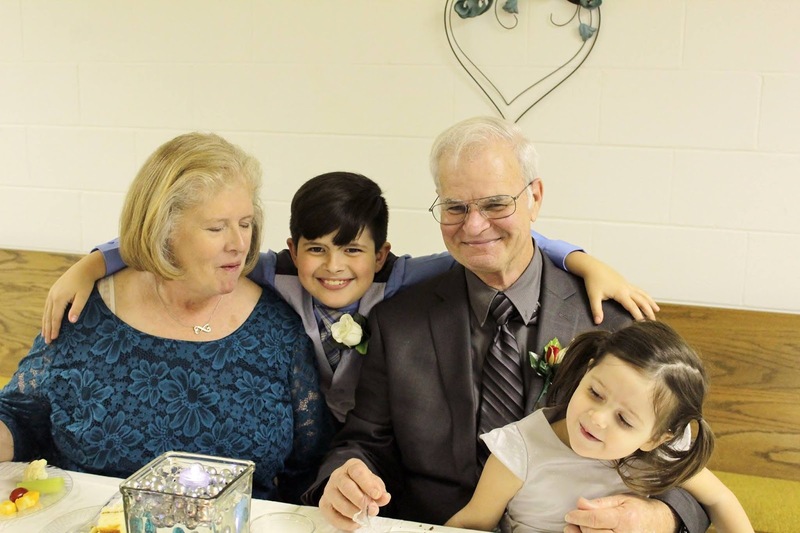 Grandson Zeke was groomsman. Emma is the twincess on the left and Araya on the right, looking up. Abby the flower girl in front. Their daddy Jeff was home with their cousin who is staying with them this semester--strep throat, ugh! Mommy Michelle was taking pictures. Emma coming down the aisle. 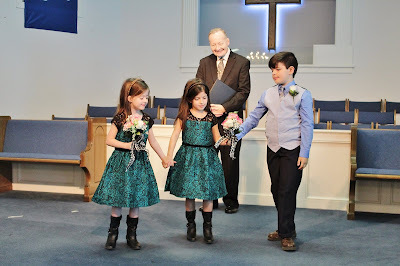 She and Araya were holding hands and walking in together during rehearsal so I don't know what actually happened by time to go down the aisle. I see Araya peeking out from behind Emma's shoulder. 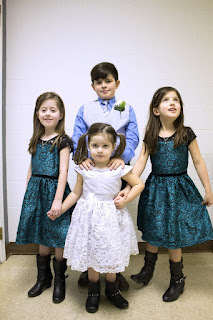 A little story: just before they were to walk in, Araya had tossed down her bouquet in the back room announcing she was tired of playing with it! I said "now it is the time you are supposed to be holding it! Take your sister's hand. It is time to go!" Between Aunt Melissa and I, she got down there. Oh, and I was still hearing from Araya mostly---"but I want to be flower girl!" Diane, Melissa and I all had to tell them that being a bridesmaid was way better. 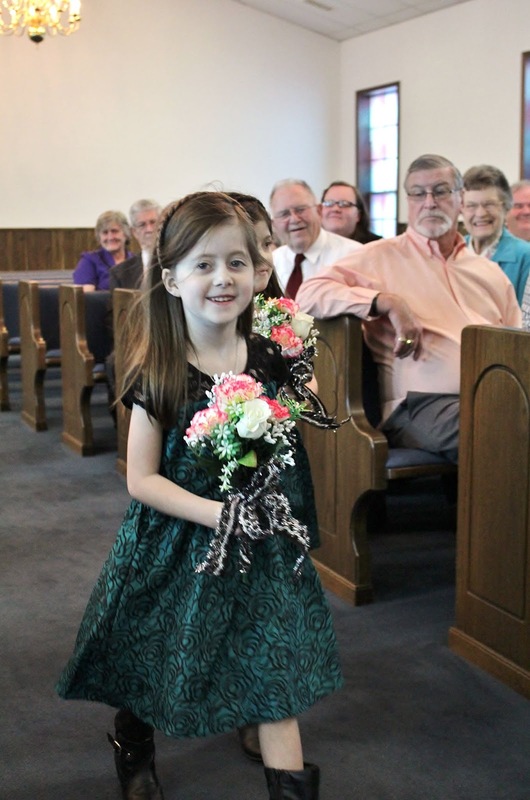 Flower girl job is for little babies, not young ladies! I heard too that they were walking heel to toe in their boots entertaining the guests. Whatever, right? Abby taking her job quite seriously! We were also celebrating my parent's 66th wedding anniversary but in typical parent fashion, they deflected any attention away from that. Still quite an achievement. I am proud to share our future anniversaries with them on their day. I felt like doing a fist pump---YES!! Wedding Party. Paul, his best friend, was best man. He was our "cupid" and the reason Charles and I met in the first place watching those Bama games at his house. Charles son Brian and his wife Melissa, my DIL and SIL now, provided the cakes as our wedding gift and kindly helped with the food. Here is the cake cutting (I look goofy in this shot but okay!) and showing my pretty cake along with his way cool "Dr Who" cake. Melissa baked 12 layers of cake on Thursday to do both of these! Charles is a huge Star Wars, Star Trek and Dr. Who fan so it was a perfect choice for him! Zeke was saying something to me about now I was his real grandmom. Yes, I am! Won't he be a handsome man when he grows up?! Love this man and these kids. After the reception my family pitched in to clean up the fellowship hall. Charles and I unloaded the vehicles and then met our family at Effina's in downtown Anniston for supper. Came home and opened wedding gifts and cards. I will be sending out "thank you notes" this week. Neither of us was expecting gifts---we just wanted folks to come celebrate with us if they could especially since that required some airfare for my family. I was missing only one sibling. Friends I did not expect to come, did. The quilt groups were represented. The leftover food either went home with Brian and Melissa or Michelle at cleanup time. On Sunday morning when I had time to sort through what we might use at home, we ended up taking most of the leftover wedding cake (not the topper though! 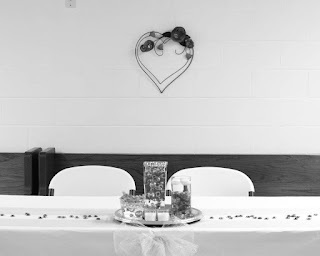 ), leftover disposable plates, cups, napkins and the transportable punch, veggies, cheese cubes, nuts and mints out to Michelle and Jeff on Sunday afternoon. 7 people in the household would make far better use of all that than the two of us. None of us had had lunch yet so we had an impromptu buffet thing on their kitchen table. Groom's cake AND bride's cake? No problem! I was resisting going through all this traditional ceremony stuff when we first started talking about this marriage thing, setting a date and such. Charles insisted that I didn't have to do what I did the first go-round (in a church but almost eloping) He wanted me to have the memories, my family close, an engagement ring, all of that. I am happy that he did convince me. It was an almost magical time and I felt so completely loved by not only him but our families and friends. Every girl needs to feel like a princess for one day, anyway?? Meanwhile, it is back to reality. There is stuff laying around in the sewing room looking for a place to be put away--decoration stuff mostly that Diane didn't need or want back. Melissa does wedding planning and the like so I think I am going to see if she has any need for something like 36 octagonal mirrors. Also we cannot use the gift until the giver is properly thanked so things are still sitting on the fireplace hearth. In the intervening week, Abby has stayed over one week night and the twincesses this past Friday evening/Saturday morning. 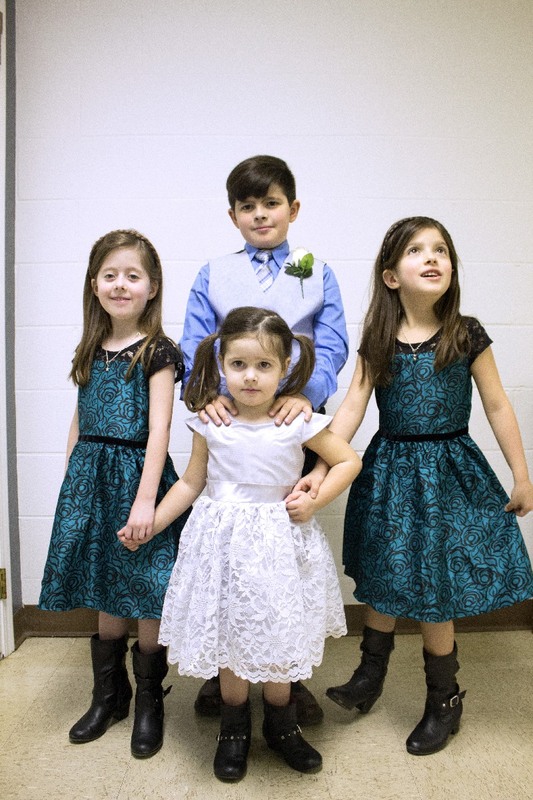 I had put a moratorium on kids' overnight stays until after the wedding--my only bridezilla-like request. I have a feeling Abby might be back again on Tuesday night as Charles thinks I will be gone all day quilting and that worked last week, LOL. Household tasks don't end just because you got married either, rather increase I am finding. Not complaining, just a fact. Belles is having a sewing day next week and I've got to send out cutting directions or the web link head of that. That and get the ball rolling on this name change thing! Checking in from Wedding Central. I couldn't sew in my sewing/computer room even if I wanted to. And who has time for it anyway? A couple last boxes are expected to join all this mess in the few days as well. 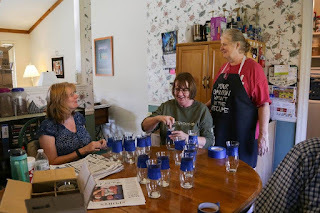 My sister Diane who is my matron of honor is helping me with the decorations for the fellowship long distance. She worked on adding bling to some practice glassware to decide on the color and shape for about a week. Then we debated about glass stones versus water beads too, Skyping, texting, calling and emailing, LOL. To that end we have 6 inch hurricane vases (36 of them!) along with octagonal mirrors, aqua and clear water beads and silver beads etc that she had shipped to me. My "colors" are teal and gray/silver but only because my dress is teal and his suit charcoal gray! Now they are part of the decorating scheme. Thursday night before the wedding when Mom, Dad, my two sisters Diane and Janet along with my niece Randi who will be our videographer arrive, we are going to have a glitter applying party. Diane has the process down and will get us work bees in gear. I am to get the water beads to soaking in two separate large Lowe's paint buckets on Wednesday evening. The buckets are hiding behind the boxes. I think I am done with all the shopping until Melissa gets me the shopping list for the foods she and my future son-in-law Brian will be preparing/setting up for us. The reception supplies and punch ingredients are on hand. The attendant's gifts are purchased and wrapped. I spray painted that basket for any cards our guests may have and turned part of the driveway, several rocks and a one of my socks not covered by my sandal straps and lovely teal color. We meet with the florist one of my Belles had recommended. Miss Pauline will be working on them once the Valentine's Day craziness is done (going with silk). We got the marriage license on Wednesday. I got invitations sent out for Friday lunch out with my friends and family as well as invites to the Rehearsal Dinner. I am not fond of having to write things out by hand anymore but did it anyway! I've got a few minor things to tend to tomorrow but I think I will done with wedding related tasks till the follow week and crunch time. As of this writing we are 13, almost 12 days away. Next week I will be concentrating on cleaning house and readying for house guests. Mom and Dad will be staying with me here. The girls have a hotel room. 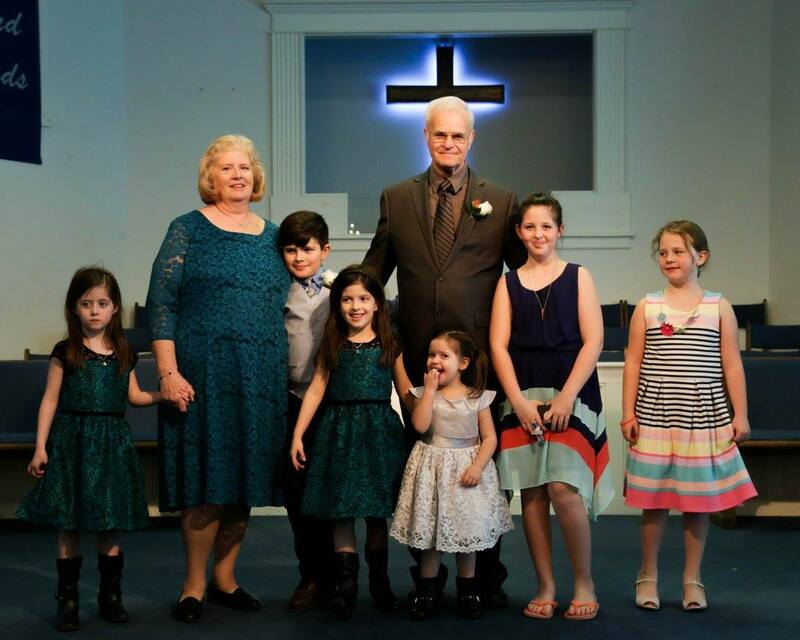 One brother and niece will arrive on Friday and my brother and SIL in TN will be driving down on Saturday as well as another friend from TN and her husband. Two friends from high school will be coming too, much to my surprise. This is going to be fun! Today at church some of the parishioners that we normally sit by were saying "you're getting married!" or "when's the big day?". The one woman with three young sons that almost look like triplets said she assumed we already were married. Apparently word is spreading! Pastor said he would put it in the bulletin and announce it next week but had wanted to check to see if that is what we wanted. Other than that the usual household stuff is keeping me busy. I am always washing something it seems. Washing or cooking! Charles has been working a bit out in the shop organizing his space. A couple days ago we went out for two 4 x 8 sheets of pegboard and furring strips to mount it on the studs out in the shed. He has been digging into a big ziploc bag of hangers I had to hang a lot of the most used tools and supplies and clearing space from the shelving and floor out there. This afternoon he was doing some preliminary wiring for a ceiling fan and track lighting that we had brought back from the damaged building at his son's. Eventually we will run electricity out there but until then we can string extension cords out from the carport should he need some power tools. They were supposed to cut up the downed tree at his son's this past Friday but that was dependent on the weather. Charles went out anyway to dismantle his work tables in that space since the lumber could be re-used when the new building goes up. There are still things buried on the other side of the tree. I went out with him the day he needed to try to label the playlist but stayed home Friday working on the invitations and other home tasks. Saturday he got a call from his pal Paul (the best man) about the 220 wire to his outbuilding being cut by some workers on the septic system. Electrical work---man, he was out of here like a man on a mission! LOL, in his spare time he put some bling on my treadle machine. One of these days I will have to try it---when I am not steam cleaning my rug, for example. Always something! Not sure exactly how to start this post as things tend to blur together after awhile. When I left off last time, Charles and I were going to watch the 4 youngest grandkids so their mom could take their cousin shopping for school clothes. She will be staying with them this semester and the clothes she brought with her were not meeting the local school dress codes. Fortunately we had good weather and did take the kids into our town's park to play on the cool slides and stuff there. Then we scored point by taking them off to Mickey D's for ice cream cones. Well, there was some grumbling about wanting sundaes but Gramps and I said they all got the same thing this trip. 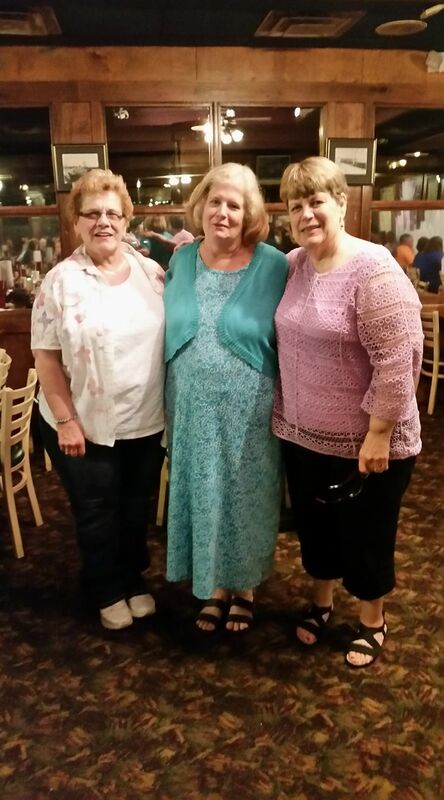 This past weekend, the "twin-cesses" came for an overnight stay. I had some helpers for "dough smashing" (Pride of Iowa cookies call for the dough to be flattened with a glass dipped in granulated sugar). I sent most of the output home with the kids though. Plans are to have their older brother Zeke come this weekend. We thought the youngest Abby was going to come Monday evening but at the last minute she decided she would stay with Mama and play outside some more, LOL. Instant grandmom, that's me! Charles and I had decided to table several of our household projects until after the wedding. Mostly those plans consist of painting the master bedroom and putting up some shelving on the wall above the desk. He hung a blind I had gotten for the bedroom that had been waiting while the bathroom work was completed. However, Charles had gone out to help his son with a plumbing issue and came home with a closet rod and brackets. Way back in July 2014 I had posted about the jerry rigged closet rod in the master bedroom and wondered how it had managed to not snap like a twig. It is fixed now, thanks to Charles. We could address this before it got too loaded up with stuff now that those 81 quilts were delivered. We do have plans to paint, re-tile my bathroom with the same tile as the master bath we just did, re-size the mirror, replace the light fixture and toilet to a low flow chair height one. Just generally update the room a bit. Again, that needs to wait till after the wedding. Mom and Dad will be staying here when they come down and people will be in and out. Better not to have the house all torn up! I have paint color cards stuck up in both rooms---looking at pretty blue for the bedroom and at first a green for the bathroom. Now I am leaning towards a butterscotch yellow. Jury is still out, LOL but I have time to think about this! I see more trips to Lowe's in our future. If anyone were to ask what we might need as a wedding gift, the answer would be Lowe's gift cards. We have not been idle though. He hung a blind I had gotten for the bedroom that had been waiting while the bathroom work was completed. He turned his attention to the utility shed and I went out there to help decide some of the "stay or go" items. In this picture from the bush cutting down days, you can see some of that giant mess behind him! We filled up the trash can rather quickly and had to ask a couple of the the neighbors if they had room in theirs for a couple of things. I resisted going through the subdivision near us at the dead of night to sneak a bag in some stranger's though, LOL. As soon as the can was emptied last Friday morning, I had it almost 3/4's full again with the bags we had waiting. At some point he will run electricity out there but a lot of clearing out needed to be done to gain some floor space. Using the scrap lumber bits out there, he put up some shelving to get the Christmas decoration boxes up off the floor. He also re-purposed that old wooden closet rod he just took down in the bedroom and got some chain to hang the ladders from the rafters. The old door that DJ and I had taken down between the kitchen and laundry room is now a work table hinged to a side wall. He put some vinyl tile on the top of it yesterday and added some trim and it looks pretty cool! He moved and re-organized the shelving units and put up a wire shelf unit that DJ had never mounted. It now holds a couple cord reels and a few more items. All the weed eaters are mounted on the other side wall too. There is still some tossing to be done and a surplus of nails found a new home at a friend's house who has a building project coming up but it is looking up! The cat carrier you see below is only in a temporary home at this point. We replaced the rickety sawhorses this past weekend when Harbor Freight had them about 40 bucks cheaper than we had priced at Lowe's. You would not believe how much cleaner and open this space looks like already! Oh, that yellow roll of batting is out of there now too as I've got it in my car to run down to the church next week. He needs to see if the two compressors we have in this heap still work and the old kitchen chair back needs dismantled for parts. Charles at work organizing the shelves but you can see the ladder things he rigged up in this shot. 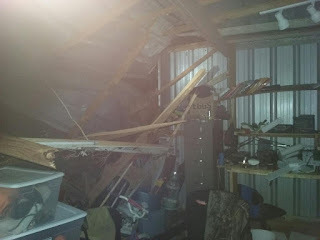 Turns out that ours was not the only shed we had to worry about. This Sunday his son or daughter-in-law called and the hot water heater had been tripping off repeatedly for a 24 hr period. Also it had been raining quite heavily (windy too) and a roof leak problem had returned. Charles went out to see if he could fix the problem. I know he cleaned out the gutters a bit and checked into the breaker situation while he was there. Being an intermittent problem, they would have to continue to monitor it. 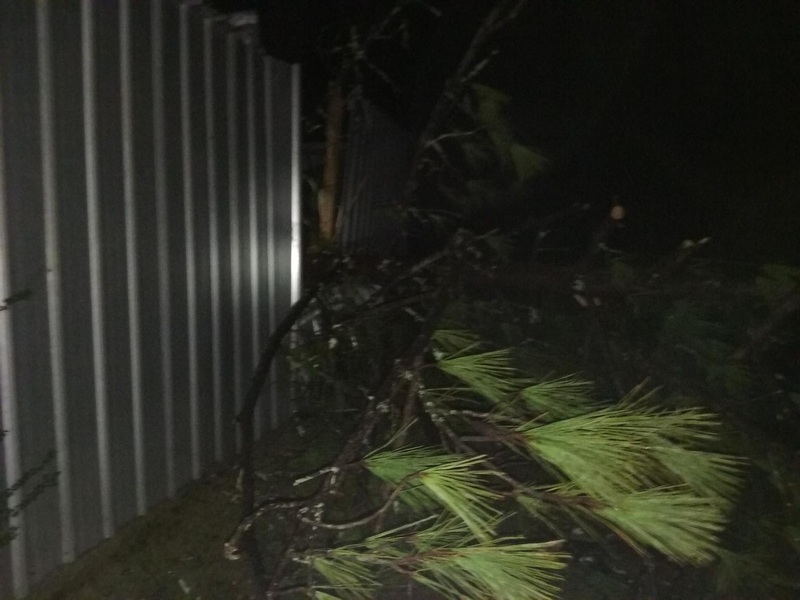 While he was there, a pine tree uprooted and sheared the wiring from Jeff's mechanic shed but hit the other one that he and Charles shared. I was just grateful that he was not out in it at the time as he was headed that way for some of his electrical supplies. The one that got hit sort of sits at right angles to other one and the tree went through the left hand third of the building, raising the roof. 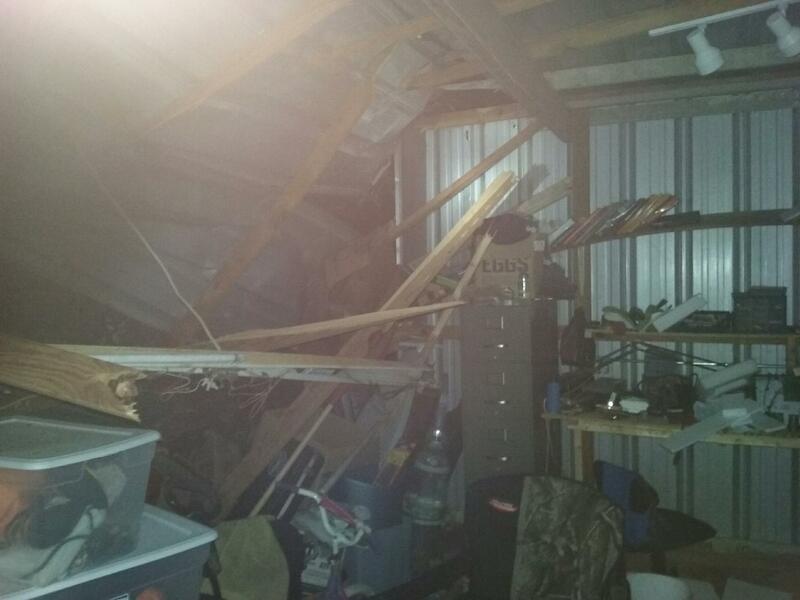 It missed his big riding mower and all of his electronic equipment and "toys" but bent the tar out of his shelving. There is a motorcycle and tiller under all this mess among other things. I went out to help clear things out and see what we could selvage. The insurance adjuster is due out tomorrow morning but he and Jeff were allowed to remove what was not damaged with orders to keep away from the damaged areas. Charles was able to store several wagon loads of stuff in his old apartment downstairs in the house. Some stuff got tossed as it was wet or no longer needed. Some stuff came back here with us as he sets up some shop area here. That wire shelving unit you see against the wall in one of the pictures of our shed above got mounted and nicely holds his electronic course books. It is shaping up! In between, Wendell dropped off a length of leather for the treadle machine so that is now fixed though I have not had a chance to sit down and try it. He also started drilling out the bush stumps so they can be treated with Stump-Rid product. The battery packs both died or he might have gotten a bit further this afternoon, LOL. 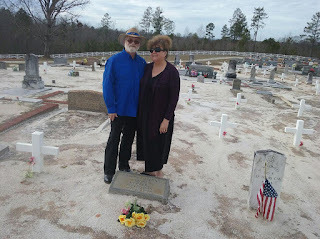 We had the pleasure of meeting his cousin Jim and his wife Rosemary a week ago Wednesday. They were up from Ocala, FL and doing some geneology work near here but on the Georgia side of the state line. Jim suggested meeting up in Oxford for lunch near the exchange. 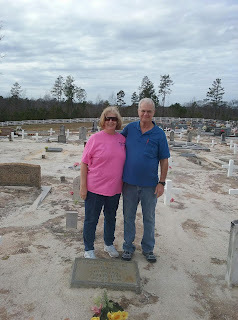 Then we all went out through Cleburne County and a church cemetery where their mutual great-grandfather (or was it their grandfather?) is buried along with some other relatives. I believe they plan to come up for the wedding. 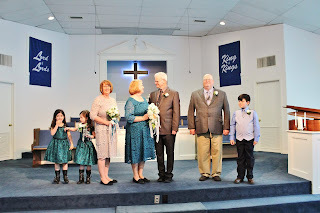 We were finally able to meet with the pastor a week ago Sunday and tour the fellowship hall we will be using for the reception, discuss what we wanted to do for vows, etc. There are several options for the bride dressing rooms and other logistical things explained that will help us get the supplies and such we need. Charles is afraid to use the linen table cloths so I think we will be making a trip out to Sam's for disposable table cover once we get a linear measurement of the tables after church next Sunday, LOL. I went shopping yesterday after the Belles meeting for some of the things we will be needing but still need to go for some of the punch ingredients. 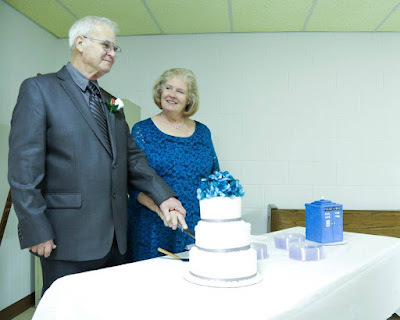 Charles' oldest son and daughter-in-law will be helping with the reception and providing the bride and groom's cakes as our wedding gift. I am thankful for their help! Melissa and I recently discussed what we wanted to serve with cake and punch and they will prepare/purchase those items or that is the current plan! I also have a lead on a florist so that is what I need to address next along with some rehearsal dinner details. At this writing if you don't count today, 30 days to go! All this excitement is sort of tempered for me this week as I am mindful that Thursday the 26th would have been DJ's and my 18th anniversary. February 1st marks the 3rd anniversary of his passing. If I don't mark these dates, then I don't know who will and he deserves to be remembered. He was a good man and loved me as I loved him. I am deliriously happy with Charles and am looking forward to being his wife but I do honor DJ and our life together for 36 years. This made me who I am today, taught me what it was to be a wife and in a long term relationship. I think Charles would thank him for that if they had met. Charles knows what loss is as well. We know just how blessed we are to have this 2nd chance at love and marriage and will treasure every day that God grants us. That we are ready to try again is a testament to our loved ones, don't you think? Of course, it probably goes without saying that I am not sewing. Who has time?? I barely know my own name, LOL, and after all, it is changing soon! I do plan on doing the Fat Quarter Shop 2017 Make a Wish quilt. I purchased the kits and fat quarter stack of Bonnie and Camille Basics with Christmas monies from Charles and my dear Belles. I want it bigger---I think, LOL. The first block was just released mid-month. I will get to it---actually tempted to make the blocks larger than 5 inches and re-size them either 7.5 or 10 inch finished. Will re-visit that when I can fiddle in EQ a bit----in my free time, HA! I would love to have the long planned Disappearing 4 patch in blues and white done for the master bedroom and maybe that is where my focus needs to be. Once the room is painted it would look great in there! That and on the queen sized headboard/bed frame that we will be hunting for at some point. Just gathering style ideas at this point. And there you have it for this check-in post. I need to get Oscar into his bed, hit the shower and wind down for the night. Not sure where this day went but it is about over. THX for stopping by to see what's up. 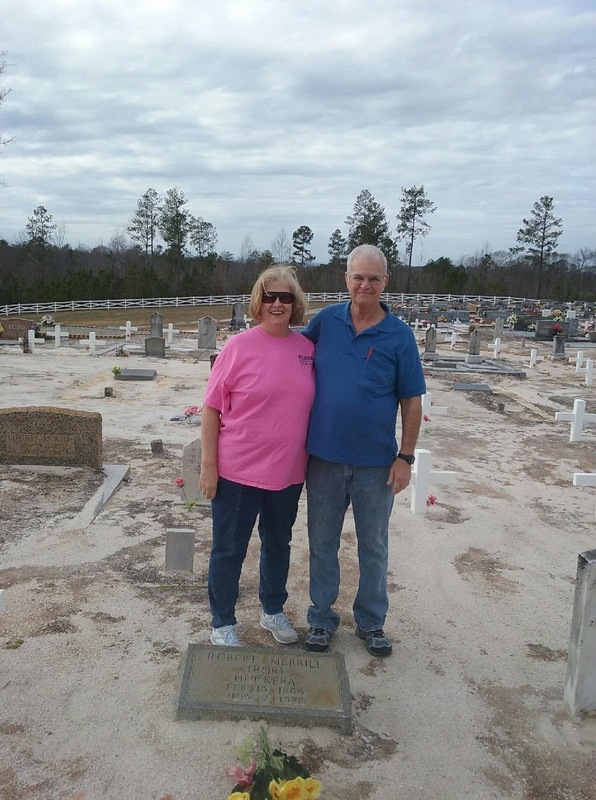 In my post in late December, I mentioned that Charles was working on a forced bathroom repair situation complete with leaky and leaning toilet and disintegrating particle board in the master bathroom. The project was finally completed on Friday January 6th--woohoo! I've got some before and after type pictures to share. You can see Charles down on his back in the crawl space with the flooring cut away that was under the ruined flooring. He got it all filled in and then discovered that particle board was just flaking away when the two courses of vinyl flooring were removed. (DJ had just put one layer down over the existing flooring while my bathroom went down to the bare flooring). He had to cut out about a 24 x 30 some section total. Thankfully we had the two varying thicknesses of plywood on hand for the initial placement and no more lumber was required. Just lots of that mud stuff and sanding. In order to remove the leaky toilet, the curved counter top over the stool had to be removed. Here you see the sink's residence while the work was ongoing. In this picture Charles was getting ready to cut down the existing counter top over the vanity from the top side. You may be able to see how it narrows where he has his left hand placed. We were able to salvage the trim for the cutaway and re-use it. I am not fond of this counter (UGH it is in the kitchen and my bathroom too) but it did save money to NOT replace it. How it looks now. New bathroom accessories and door pulls. The wall paper border we applied to covers the tears to the paper when the counter came out. Charles idea there so we would not have to strip off the rest of the wall paper or paint. It brightens the room up and matches the existing drape in there. The vanity also got a new coat of stain to freshen it up. He also tried to cut down the full size mirror that had been in place. That didn't work out so well. A friend saw a comment I had made of facebook and suggested a place near here that can cut hers down and then she used molding and rosettes on the corners to give it new life. Too late for mine but we are talking about updating mine next. THX Brenda for the suggestion! We picked out this mirror from Lowe's---our home away from home lately! !--when the plan did not work out. Charles is a retired master electrician so it was a piece of cake for him to move the electrical box over a bit to center the new light fixture over the sink. The problem was that it did make a larger hole. I thought we would have to get a different fixture with a bar like base but he suggested using a ceiling medallion, painting it and using it behind the round light base. I didn't get what he wanted me to do with two different colors of spray paint as it was not working to try to spray on the darker color on lightly. It was either one color or the other. He finally told me to spray some of the darker paint on paper plate and then daub it on the high spots. LOL, I finally "got" that he wanted me to use like a stenciling, pouncing technique to sort of antique it. In person it looks good with the light globes we picked out. The lighting is much brighter in there now especially with one bulb not hiding behind the medicine cabinet. Finally the new toilet made it into the house on Friday morning, once the flooring was completed. And here it is in place along with all new quarter round and the shelving above the stool for a bit more storage space. We got a chair height one so it is easier on the knees as several of my friend's were suggesting. One of them asked me the other day what I thought of it and I haven't used it yet!! I have always thought that one secret to a good relationship is never having to share a bathroom with your spouse or significant other if you can help it! I bought a baker's dozen more of the tile so we can use what remains in my bathroom down the line. In between tasks and waiting for glue to dry for the umpteenth time, he put a small ceiling fan up in the laundry room. I tried to do what I could to help mostly being the ground guy and holding the flashlight, LOL, That and pick up the stuff that got dropped. Earlier THIS week he corrected an long time electrical situation in my living room. For almost 20 years there have been light switches that turned on nothing. From the hallway and the kitchen I had to cross the living room to turn on any light source. Well, that was like waving a red flag in front of a bull or at least throwing down a challenge to the electrician to solve this mystery. We picked up some of his electrical tracing equipment from his home shop and he was off and running. The problem was in the wiring to the ceiling fan and he took the thing down to wire it correctly. I can turn on the living room ceiling light in three places---hallway, living room and kitchen. I can turn on the fan on its own switch--not the speed, I still have to reach up on my tiptoes for that part--but off and on works great. There is one remaining mystery switch in the kitchen and that's challenge for another day, he said. I have been happily flipping switches since he fixed it. Woohoo! Doesn't take much to make ME happy, LOL. We had some raining and cold weather recently along with some ice and freezing rain/sleet stuff a week ago Friday. Enough that they preemptively cancelled school on Thursday. In light of the cold weather he couldn't work out in the shed or set up on the sawhorses on the patio. I told him he could work on our chain saw here in the house if he protected the table. Here he is working on the primer pump and tubing which had disintegrated out in the shed. ( He took a small engine repair class after he retired.) It is still not completely fixed but it did take off some limbs on the large crepe myrtle tree yesterday! He borrowed his son's temperamental chain saw to get the last of the holly bush limbs down. I helped haul off the sections to the burn pile and did some of the go-fer stuff. Wedding plans are still in a stall pattern. That recent ice deal cancelled church on Sunday but mostly it is because of the pastor's wife's continued health concerns (recent transplant). We went at the appointed time but found a note on the door. He had lost Charles' phone number and we didn't have his cell number so we were not making connections. I think that is resolved thanks to one of church members/usher/deacon that was at the church today helping the missus set-up for a baby shower. We'll try again this Sunday. I should be writing down some of my questions and get my nose back in my Weddings for Dummies book. At this writing we are 43 days away for the big day---yep, the calendar is marked and we're counting! I haven't mentioned the critters. Oscar is back to wearing his belly band as he has been peeing on everything lately but especially since we were gone on that 2nd trip to Gulf Shores. Charles is always asking him "where is your diaper?" as Oscar shimmies out of it when he crawls under the bed. Skyler just gets more clingy but especially at night when Oscar has gone to bed. Bama Belles met earlier in the week and Lois' had recently asked me how many quilts I wanted. She had 19 that she had been holding that I did not room for at home. I knew that I needed to get the master bedroom closet emptied out to make room for Charles' things. There were a bunch in there, some dating back to 2014! I took my notebook to the meeting along with my camera to work on the numbering and documentation that will be needed for Wrap Them In Love headquarters. I kept 4 out for any immediate need and still had 81 quilts, if I counted correctly and then made a call to the Talladega Presbyterian Home for Children to arrange a delivery time. Charles and I loaded up the van and went down late Wednesday morning to facility's administration office. LOL, they were watching for us to pull up and three of the women came out to haul these into the conference room. Here are some of the more recent additions to the 81---I'll add as many as I can but Lois had made 4 Pineapple Blossom quilts and they do look a good bit similar unless you look at the borders and/or binding. I somehow missed getting two pictures taken and had to have Charles hold two of them up in the hallway. So this one is wearing tennis shoes and if you look closely a nosy kitty's backside and tail, LOL.